Classes at Vitrum Studio fill very quickly on a first-come, first-served basis. Please register early to insure a place in the course(s) you would like to take. We require a completed application and paid deposit to insure your registration for a course. Please complete an Application Form (in PDF format) and mail or fax it to us. For those visiting from out of town, click here to find a listing of Motels convienient to Vitrum Studio. This class is full, but a wait list is available. We have done many experiments here at Vitrum to learn how to control the distortion and displacement of the elements of design in kilnformed glass. These experiments have resulted in the techniques that we will share and demonstrate in this unique class. 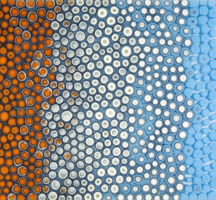 We’ve long been intrigued with the natural ability of glass to flow in the heat of the kiln, and how it displaces and distorts the surrounding or underneath glass, patterns and shapes. 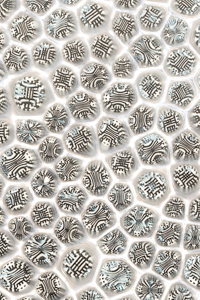 You’ll start by creating bold geometric patterns created from stringers and sheet glass, then we’ll use construction techniques and the heat of the kiln to deliberately contort these rigid patterns into flowing designs with striking optical form and depth. Controlled bubble entrapment as design elements and visual distortions will also be demonstrated and explored. You’ll create and take home a wide variety of samples that will launch your work in new directions. Understanding how to use glass powders effectively allows you to think about glass and glass design in a completely new way. You can break out of the limits of sheet glass as you become more painterly in your work, using soft lines and delicate shading rather than the harder lines of cut glass pieces. You can mix and overlay powders to create new colors and subtle hues. We will demonstrate how to make powder wafers to create realistic details in your work and you will create both a floral study of a seasonal flower and a landscape as you explore these techniques. This four-day class explores the related textures in fabrics, baskets, and weavings which are the foundations and the sources of inspiration for Erna’s creative and technical approach to glass design. Working with frit, glass powders, reactive glasses and metallic elements, students will use these materials to create components that result in unusual color shadings and visual textures. Multiple stage firings will transform these materials as they combine and react with one another, leading to beautiful (and sometimes unexpected) results. Group analysis of these “surprises” will lead to further development and understanding of the techniques covered. Students will create two wall pieces with heavily textured surfaces and aged, weathered effects, all inspired by textiles. Students will analyze firing results together, and emphasis will be placed on individual growth and development of designs and ideas, culminating in highly individual pieces. Returning students are welcome to join Erna for this session. 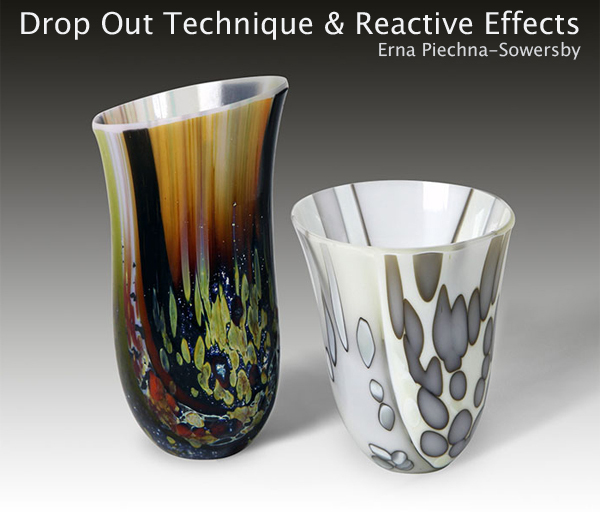 In this class Erna will cover the basics of the drop-out technique for deep vessels while you also explore the chemically reactive combinations of glass and a variety of metals. The results are vases or goblets, with smooth, glossy tops and sides, shapes that are usually only achieved by glass blowing. You’ll go through the process from beginning to end: the preparation of the blank while experimenting with a variety of materials that chemically react, the controlled drop out firing, the separation of the ‘collar’, as well as the grinding and polishing of the base and rim to produce a unique and nicely finished vessel. The colour work focuses on the reactions which occur when specific glasses and metals are combined and the chemistry comes into play. This is a field of experimentation without boundaries and you’ll learn which products are especially interesting and how you can playfully coax the glass to produce these fantastic effects. Learn from Nathan Sandberg, the pioneer of the modern Vitrigraph methods in this intensive five-day workshop that debuts here at Vitrum Studio. Nathan was very accustomed to making cane in the hot shop, and seven years ago he wanted to see if he could “make some cane” using the Vitrigraph kiln. Looking back, those early results were discouraging compared to all that he has discovered is possible to create in this small kiln today. In this workshop Nathan will cover it all. Kiln operation and set-up, stringer, how to specifically design cane and murine, and more will all be explained, demonstrated and put to use over the course of five days at his favorite studio in the country (his words). 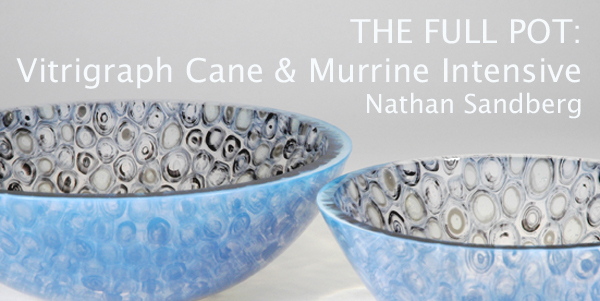 Aside from the basics, Nathan will also present his updated complex murrine methods, where thoughtful design and planning based on knowledge of how the glass moves as it exits the kiln comes into play. Each student will leave the workshop with a finished project made using their own custom murrine as well as pulled cane/murrine they can use in future projects. This workshop is for students of all skill levels. The only prerequisite is the ability to confidently and efficiently cut sheet glass. In this unique class we will reexamine this time-honored glass construction process pioneered by Klaus Moje, the father of contemporary kiln glass. Pushing the limits of what we know as strip cut construction, we will explore what happens when variables are altered. Choosing from Vitrum Studio’s extensive library of samples for this class, we will explore and research design possibilities through sample making. On the first day, each student will create a variety of samples. Then, as a group, the class will examine the results of each of those samples after firing. These carefully analyzed results will inform the design of the final larger project on the second day. In this two-day class you’ll be introduced to the endless design possibilities when you “carve” shapes into the back surface of glass using a variety of fiber materials. 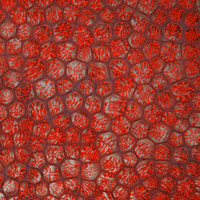 These materials, in turn, lead to vastly different surface results. This is a wonderful method to create glass panels with incredibly detailed contours that catch, bend and reflect the light. It’s a simple technique that can produce a complex, sculptural look in your work. We’ll introduce you to the technique with lectures and demonstrations, including information about which glass styles work best and the importance of correct firing temperatures. You’ll create a set of samples with multi-layered designs. After firing, we’ll discuss the results of each set of samples. With this new knowledge you’ll have the opportunity on the second day to design and create a larger pair of kilncarved panels. Tuition includes all glass and materials for the completion of the projects. Glass cutting skills are helpful but not necessary. All graphics, original artwork, site design and textual material on this website (vitrumstudio.com) is protected by United States copyright law and international treaties. You may not copy, distribute, sell, redesign, take credit for or use any material owned by Vitrum Studio, Judith Finn Conway, and/or Kevin O'Toole. No part of the contents of this site may be reproduced without the written permission of the Owners of Vitrum Studio, Judith Finn Conway, and/or Kevin O'Toole. Please contact us at vitrum@vitrumstudio.com to use or copy graphics, original artwork, site design and textual material on this website.